It’s a Bow Tie World. At least once a week, we turn our love and attention to Mill City Fineries, a growing force in the high-standards menswear market. These folks crank out a vast array of limited-run bow ties, neck ties, and pocket squares; essentials for the “modern gentlemen,” made of top quality fabrics and stitched in Minnesota by top quality hands. Those top quality hands, in this case, are down in the aletheia Workshop. And it’s a pleasure. Mill City Fineries is in good company; it seems that the local – meticulous – menswear segment is on the rise. If you want proof, visit the Askov Finlayson, Leatherworks MN, or William Rogue stores. Or watch this. Believe it! US made – and even MN made – is becoming a real value, and we are cheering it on. Check the MCF shop for their forthcoming spring line, and think of us. Down in the bowels of the aletheia workshop, we are most accustomed to dainty work. Volume is normal – once we produced 150 houndstooth bowties in the span of 8 days – but most of our projects fit nicely on the somewhat limited workspaces of an efficient shop (let’s say efficient and not cramped, if only to keep the worker happy). 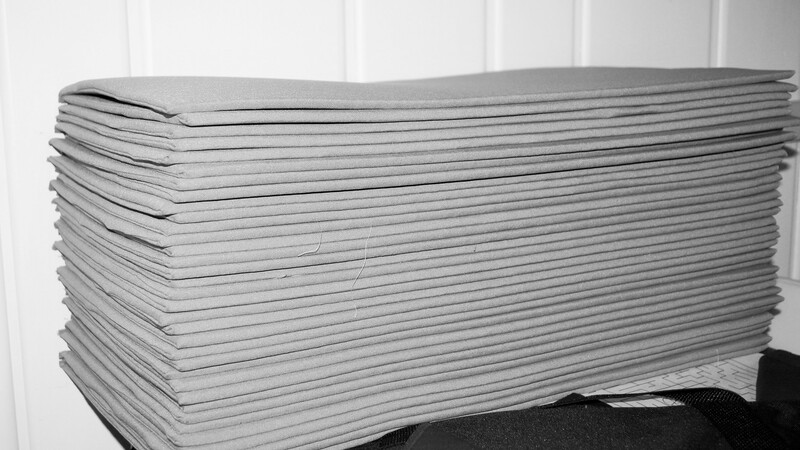 This week, instead of baby Tees or pocket squares, we’ve tackled an unusual order for a kitchens design firm in Colorado: large, padded, partitioned tote bags for cabinet doors. 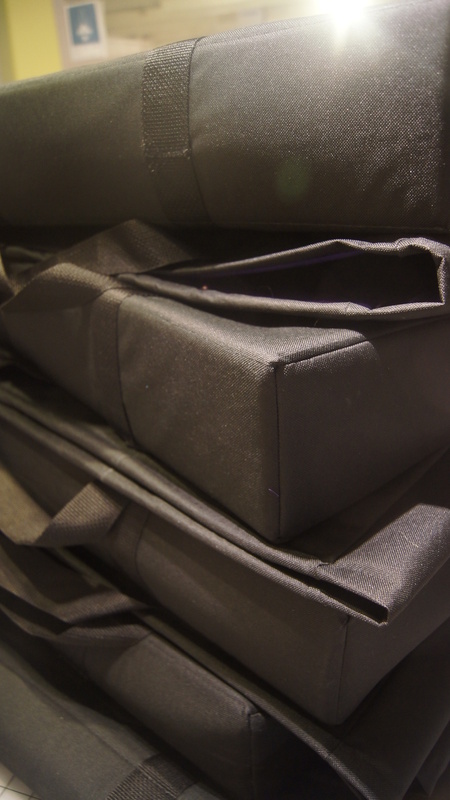 This project has included lots of repetition (there are 20 of bags, each with two partitions) and a bit of sewing from inside the bag. Use your imagination for that. Also in latest news, aletheia design + sewing service now has the ability to TEXT. Welcome to 2001!! 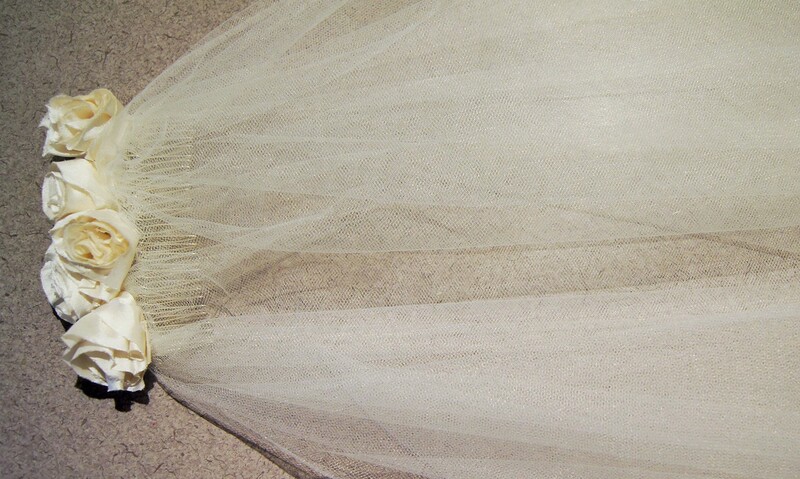 Most experienced sewers will tell you never to work in bridal – not because the sewing is awful, which it sometimes is, but because brides are crazed maniacs. Also, if you forget to wash your hands or prick your finger and bleed, it’s all over. I’m happy to say that every bride I’ve worked with so far has been a doll. Thanks, ladies, I know how hard it is. This week I’m sewing rosettes for J. Many years to you and your R! Here’s a little sampling of the first ever aletheia Junkyard collection – handmade streetwear constructed entirely of recycled, salvaged, and otherwise rescued materials. It’s wash-and-wearable, locally sourced, sweatshop- and transport ship-free, super-ethical and chock full of sass. The Hired Hands and I (I pay them in apples and PB) are starting with just Tees, but we’re hoping to expand into shorts and a nice narrow unisex pant as we solve some more creative problems. This is the real deal. We’ve got labels, hang tags, 2 sergers, a zig-zag, and an aspiring coverstitch, we’ve got freelance graphic artists to pay, it’s serious business. I’d like to share some more of the vision with you, and work through the raison d’etre of the brand, but for now, just have a look and say what you think. As a work-at-home Mom, I’m sure you can guess how I’m dying for feedback. 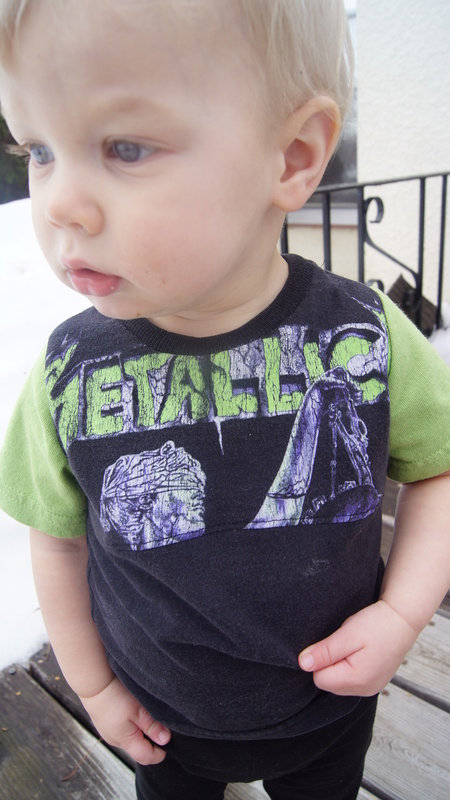 Michael demonstrates a metal-head-inspired look, size 12M. Working on my prototype line for aletheia Junkyard – it seems like a pretty simple process, but I’m running into lots of problems to solve. First of all, can you get it over a baby head?? Can the graphic be read? Are the sleeves a perfect fit? 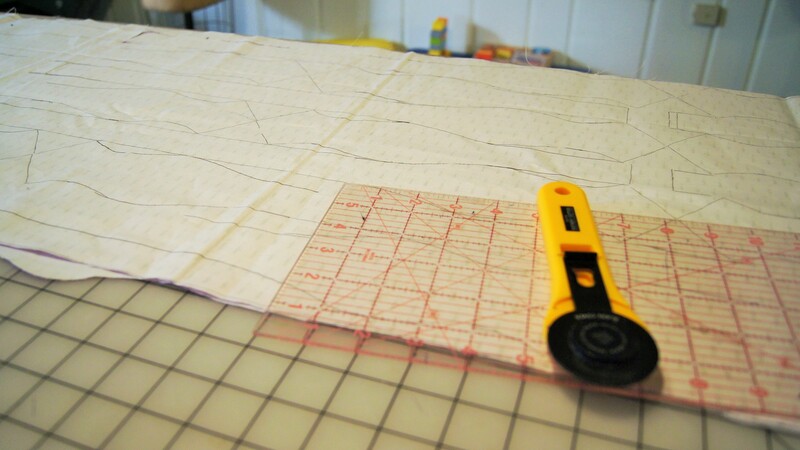 Not to mention the construction details – snap placket or no snap placket? Clean finish techniques? and how to construct them in enough time that I won’t have to charge $50 for a recycled T shirt?! Esther was such a stinker this day… or maybe Mama was the stinker. Anyway, here’s an illusion of peace for the sake of fashion. 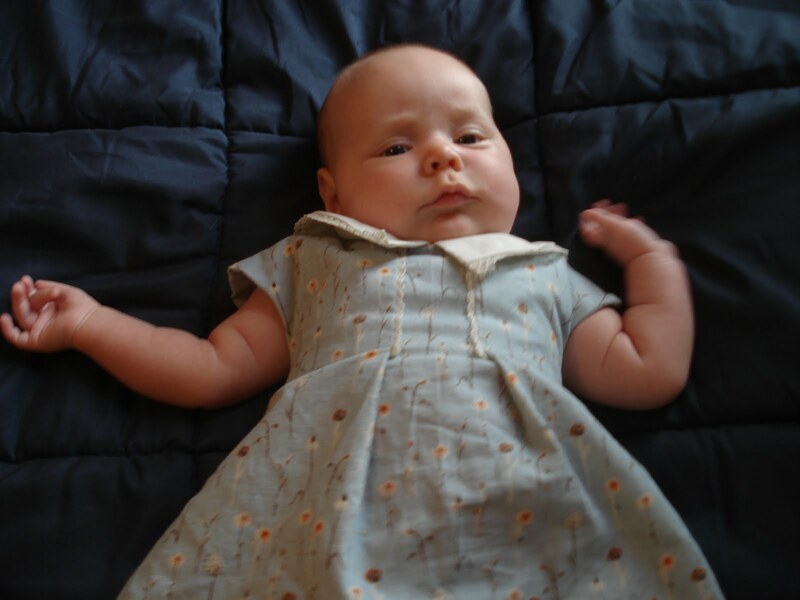 The dress was made for her when she was a baby. I have to say, though the proportions are a little off, it still works as a tunic two years later. 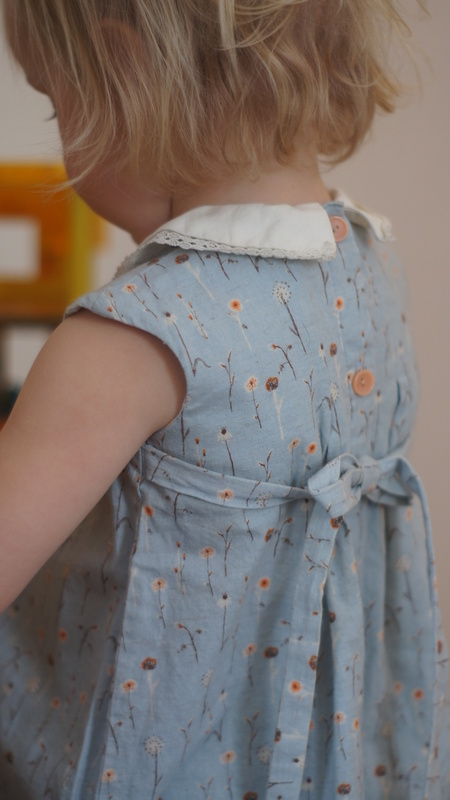 I’m trying to gear my designs more and more this way – if you are going to pay boutique prices for a kids’ garment, wouldn’t you want to have it around for more than a few months? Maybe if I had placed the waist a little lower, it would look a little more believable as a 2T garment. I have orders out for woven labels. I’ve been cutting out my Junkyard Tees while I wait. Cutting these T-shirts is addicting… it feels so non-committal. It feels kind of like doodling in a sketchbook that nobody will see – I’m thinking about what I’m putting together, and it matters, but I’m keeping it experimental and fun. I have so little to lose, except for the $130 I spent on those woven labels, so why not enjoy it? This attitude will quite possibly get me nowhere, I’m afraid. Oh well. At least my kids will have some good pieces when these are all sewn up. 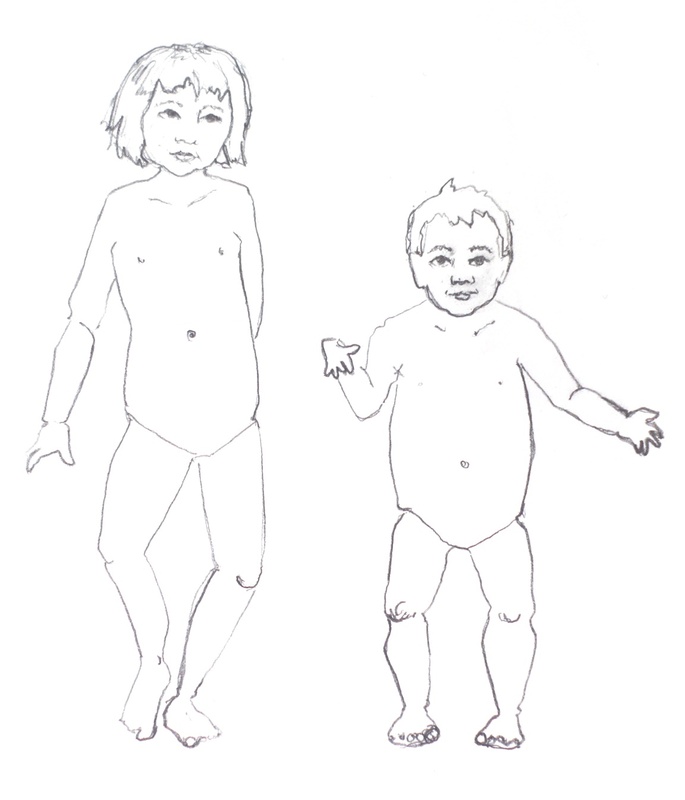 I’m brushing up on my fashion illustration… and realizing that I learned nothing about babies and children in my illustration coursework. My textbooks have nothing, and the web is pretty scant on information, too. 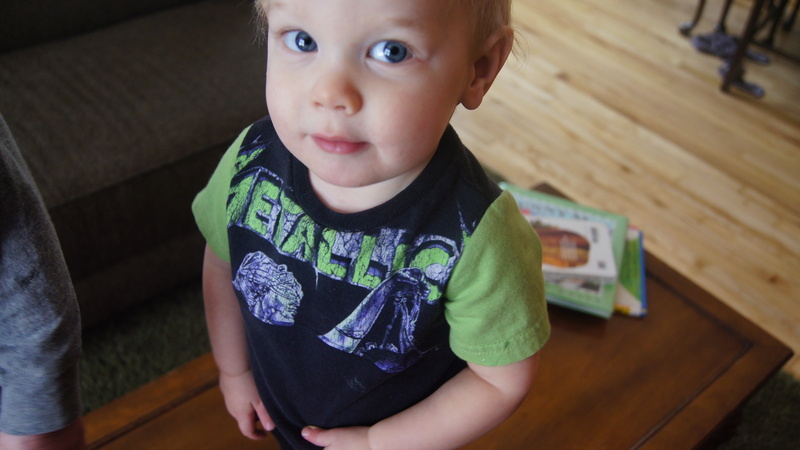 I think I’ve decided that a 12 month old is 4 heads, and a 2T is 5. Anyone know a resource for childrenswear illustration?? I’m thinking of turning to kids’ books for answers. Here’s a relic from the little bird days, my old parent brand name that I wasn’t sold on – one of the few SOFT GOODS garments that didn’t sell. Let me know if you have a home for it! It is a 6 mo size that could also probably fit a 3 month old, and convert to a mini or a tunic for up to 18 mo, if your gal is trim. 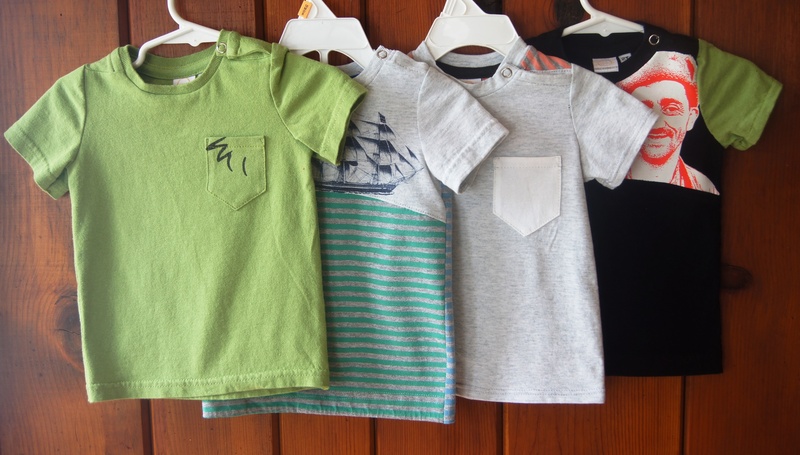 SOFT GOODS is a collection of dressy fashions for baby made of recycled/salvaged vintage wovens. Look for more to come, now that Michael is out of his first year. Woo Woo! Michael endured his first photoshoot today. I’m trying to get a few things photographed before they won’t fit anybody. I’d say he is a natural model, if it weren’t for the one hundred other photos I deleted.